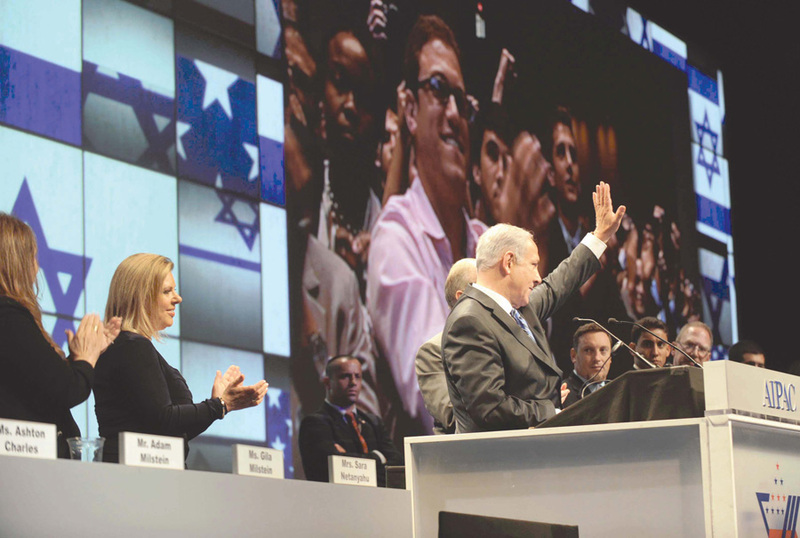 Israeli Prime Minister, Benjamin Netanyahu, gave this speech at the American Israel Public Affairs Committee (AIPAC) conference on May 23, 2011. My friends, before I talk about things about Israel, I want to say something about the scenes on television that I saw today and you have been seeing as well. When tragedy strikes America, Israel - Israel feels an immediate identification. And tragedy has struck America. In recent days floods and tornadoes have claimed the lives of hundreds of Americans, including today in Joplin, Missouri. All I can say is, America, we're with you on this day, on every day. And that's very evident from the things I just heard from my two close friends. Speaker of the House John Boehner, Senate Majority Leader Harry Reid, you lead the many friends who are here today, the distinguished senators and congressmen and congresswomen of the United States of America. I want to greet AIPAC President Lee Rosenberg. Rosy, I learned the other day that if I take you on, it's not going to be in basketball. It will be in soccer. And Executive Director Howard Kohr - Howard, you I'm not going to take on in anything. I want to welcome here also the representatives of the Government of Israel, Members of Knesset, U.S. Ambassador to Israel Jim Cunningham, Ambassador-designate Dan Shapiro, my beloved wife and the mother of our two boys, Sara, and finally, our terrific Ambassador to the United States, a man who knows a few things about the U.S.-Israel alliance, Michael Oren. Well, it's not just food we're bringing to America. Take medicine. Israel is advancing cure for multiple sclerosis, Alzheimer's, cancer. We've developed mechanical means to make paraplegics walk again. We've placed a tiny diagnostic camera inside a pill. I have not swallowed it, but I understand it's quite effective. And you've just heard of this miraculous bandage developed by an Israeli company that has helped save Congresswoman Gabby Giffords' life. And I wish Gabby, a great friend of Israel, "Refuah Shlema", a happy, quick, speedy recovery. My friends, the American people's support for Israel is reflected in my invitation to address a joint meeting of Congress tomorrow. Thank you, John Boehner, for that invitation. I will talk about the great convulsion taking place in the Middle East, the risks and the opportunities. And I will talk about the dangers of a nuclear-armed Iran. And I will also outline a vision for a secure Israeli-Palestinian peace. I intend to speak the unvarnished truth because now, more than ever, what we need is clarity. And events in our region are finally opening people's eyes to a simple truth. Events in the region are opening people's eyes to a simple truth: The problems of the region are not rooted in Israel. The remarkable scenes we're witnessing in town squares across the Middle East and North Africa are occurring for a simple reason: People want freedom. They want progress. They want a better life. What will change this? One word: Democracy - real, genuine democracy. And by democracy, I don't just mean elections. I mean freedom of speech, freedom of press, freedom of assembly, the rights for women, for gays, for minorities, for everyone. What the people of Israel want is for the people of the Middle East to have what you have in America, what we have in Israel -- democracy. So it's time to recognize this basic truth. Israel is not what's wrong with the Middle East. Israel is what's right about the Middle East. My friends, I spent my high-school years in Philadelphia. I understand it's developed quite a bit since then. But during those years, when it was a sleepier town, I used to go visit the Liberty Bell. Now, as Prime Minister of Israel, I can walk down the street and see an exact replica of that bell in Jerusalem's Liberty Park. On both bells is the same inscription. It comes from the Bible, from the book of Leviticus , "U'kratem Dror BaAretz L'chol Yoshveha", "Proclaim liberty throughout the land." My dear friends, this is the essence of the great alliance between our two nations - two peoples bonded in liberty and seeking freedom and peace for all. That's what this alliance is all about. And you are part of it. You maintain it.